I’ve used the cardstock Elegant Eggplant and Pretty in Pink. 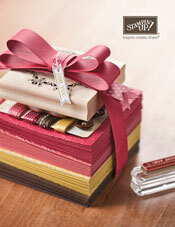 Plus the inks White Craft, Black Staz On, Elegant Eggplant, Pacific Point, Pink Pirouette and Certainly Celery. I wheeled the standard Dreams wheel in White Craft over the Elegant Eggplant cardstock (love the white on Eggplant!) 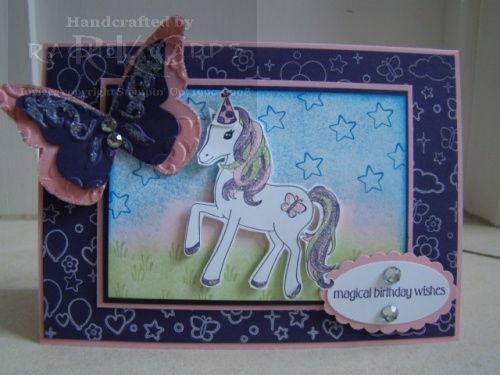 and then I sponged on the pony’s background using the Pacific Point, Pink Pirouette and Certainly Celery. 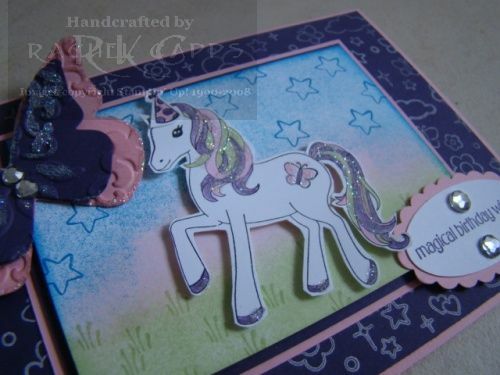 I stamped the pony in Black Staz On and then cut out her out and coloured her in using my blender pens and ink pads. A touch of two-way glue and Dazzling Diamonds sparkled her up! 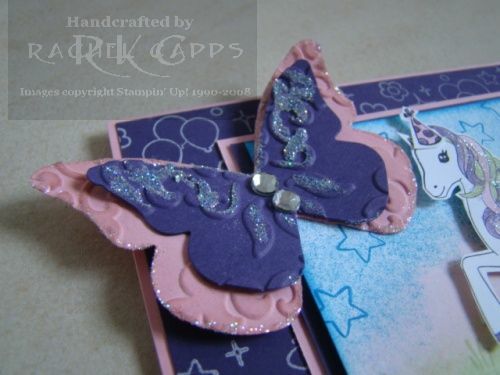 The butterfly was made by using the Big Shot with the Vintage Wallpaper embossing folder and then the Beautiful Butterflies Bigz Die – a little bit of two-way glue, a touch of Dazzling Diamonds and a little bling and away she flies! And a close up of the sentiment, using the Oval and Scallop Oval punch with some non-SU bling. Well, I’m sure you all know the new catalogue has arrived by now! 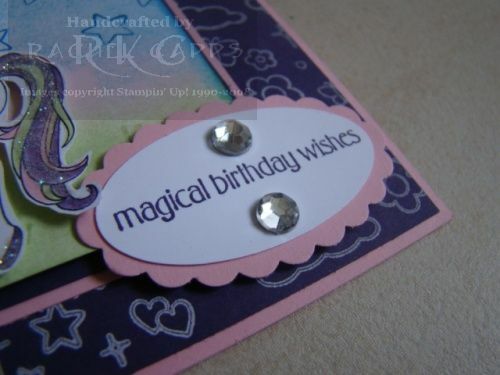 This is a card I made from one of the new stamp sets, Party Hearty, for a dear friend’s daughter on her 4th birthday. I used the colours Rich Razzleberry, Pretty in Pink and Kiwi Kiss (retired) and based the design from a card I saw at Convention. I simply adore the balloon’s design – can’t get enough of it! 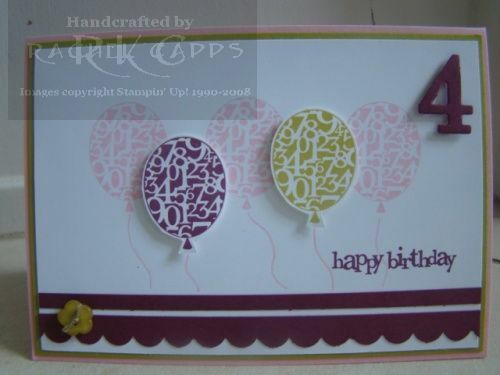 And the number 4 was made using the Medium Sizzlits Die, Stampin’ Up! Timeless Type Junior Alphabet, and the Big Shot.